Are you dealing with spine pain? Here’s everything you need to know about its causes, your symptoms, and what you can do about it. Are you dealing with spine pain? If so, you’re not alone. About 80 percent of adults will experience lower back pain at some point in their lives. Men and women are equally affected. Sometimes the pain is a dull, constant ache. Sometimes it is a sudden, sharp sensation that can leave you incapacitated. While acute back pain can heal on its own, studies show as many as a third of sufferers still have moderate pain a year after the initial episode. Another 15 percent still have severe pain a year on. If you are one of the millions with acute or chronic lower back pain, we’ve got the information you need on symptoms, causes and treatment options. Pain that is worse after sitting. Pain that travels to buttock, legs, and feet. Your lower back supports the weight of your upper body and helps you walk, bend and twist. It also supplies sensation for and powers the muscles in your pelvis, legs, and feet. Spine pain is linked to the way our bones, ligaments, and muscles fit together and move. It can be the result of an accident or injury from lifting something heavy. Or it can develop over time as you age, especially if you have a sedentary lifestyle. Everyday activities that you do without thinking like sitting all day, improper exercise techniques, poor posture, and spending too much time slumped over a screen can do serious damage to your spine before you realize it. How long your pain lasts provides clues to its cause. For instance, a degenerated or torn lumbar disc can feel just like a pulled muscle. But muscles and ligaments will heal quickly. A torn disc may not. Strains and sprains are the most common cause of back pain. Sprains are caused by overstretching or tearing ligaments. Strains happen when there’s a tear in tendons or muscles. Things that can lead to strains or sprains include lifting something the wrong way or something that is too heavy. It can also include an abrupt or awkward movement that injures your back. Such movements can also trigger painful spasms in your lower back muscles. A variety of structural problems can also result in spine pain as the joints, discs, and bones of the backbone degenerate with normal wear-and-tear as we age. 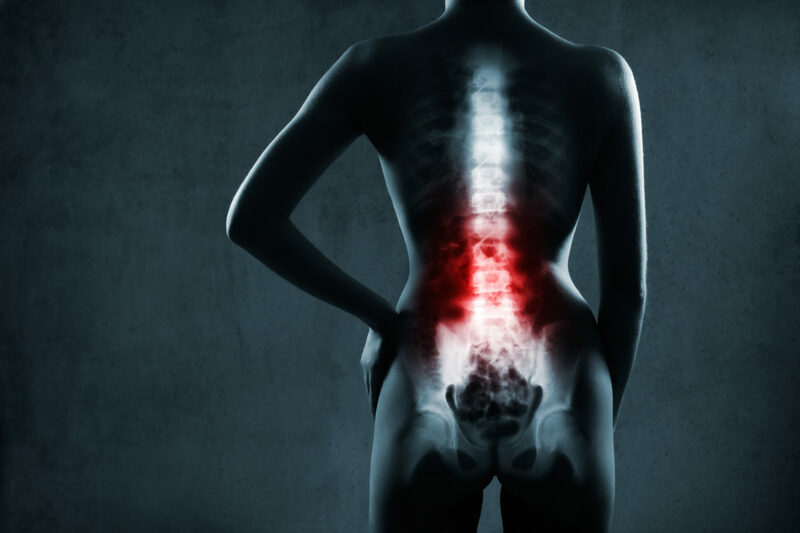 Some kind of trauma, such as from a car accident, a fall, or a sports injury, can also cause structural spine damage, resulting in acute and then chronic pain. Each vertebra in our spine is cushioned by discs. But if a disc becomes compressed and bulges outward (herniation) or ruptures, surrounding nerves will be pressured, resulting in pain. Sciatica, a sharp and shooting pain that moves down the back of the leg, is caused by a bulging or ruptured disc pressing on a nerve. People with osteoarthritis will have problems with the joints in their hips, knees, and hands, as well as the lower back. Sometimes spinal stenosis will develop, meaning the space around the spinal cord has narrowed. This narrowing can cause pain or numbness and, over time, leads to leg weakness and loss of sensation. A spine that curves in an unusual way is more likely to cause pain, especially in middle age. One example of this is scoliosis, a condition that causes the spine to curve to the side. Osteoporosis is a bone disease that causes a progressive decrease in bone density and strength. The vertebrae of the spine, like other bones, can become brittle and porous, which can lead to painful fractures. Spinal infection: If you have a fever as well as a tender warm area on your back, it could be caused by an infection. Other infections in the bladder or kidneys can also cause back pain. Cancer of the spine: A tumor on the backbone may press against a nerve, resulting in pain. Cauda equina syndrome: This occurs when a ruptured disc is pushed into the spinal canal and compresses nerve roots that lead to loss of bladder and bowel control. Abdominal aortic aneurysm: This occurs when the blood vessel that supplies blood to the abdomen, pelvis, and legs becomes enlarged. Back pain can signal that an aneurysm is in danger of rupturing. Kidney stones: Sharp pain in the lower back, usually on one side, can indicate kidney stones. Endometriosis: A buildup of uterine tissue outside the uterus can cause back pain. Fibromyalgia: A chronic pain syndrome that sometimes includes back pain. Many treatments exist to help ease your back pain. These treatments range from self-care remedies and alternative care to various surgical and non-surgical options. Basic self-administered remedies can work for back pain. Such remedies include short periods of rest, heat and ice therapy, and over-the-counter pain medications like aspirin, ibuprofen, and acetaminophen. If self-care doesn’t work, your doctor may suggest a non-surgical solution such as prescription medication or steroid shots. Other things you can try include physical therapy, wearing a back brace, or alternative remedies such as acupuncture or yoga. If your back pain does not get better after a 6 to 12-week course of non-surgical treatments, and your pain is severe, your doctor may suggest you consider surgery. Some types of surgery are more invasive than others and have longer healing periods. Many types of spine surgery can now be done on an outpatient basis. Microdiscectomy: This is a minimally invasive procedure for patients with a lumbar herniated disc that is causing sciatica. Laminectomy: This procedure removes part of the bone or soft tissue layer that’s compressing a nerve. A laminectomy will usually be done on someone with spinal stenosis. Fusion surgery removes soft tissues between vertebrae and replaces them with bone or metal. Over time, this procedure lets the bones grow together and fuse into a long bone that stabilizes the spine. Lumbar spinal fusion can be a good option with conditions including spondylolisthesis, fractures, deformity, degenerative discs, and stenosis. Lumbar artificial disc: A disc replacement alternative to fusion surgery. Posterior motion device: The Coflex Interlaminar stabilization device is another alternative to fusion for stenosis and mild spondylolisthesis. The U-shaped implant fits on the laminar bone, which is the strongest part of your spine. Other new technologies currently in use or in development include those involving stem cells, nanotechnologies, and robotics. In addition, the Comprehensive Spine Institute is using neurostimulation to interrupt pain impulses before they reach the brain. Spinal cord stimulation is minimally-invasive and can help patients who are not responding to other treatment options manage their chronic pain. Want more information on a wide range of topics? We can help with that! We’ve got a million lifestyle hacks that’ll open up a world of possibilities. Contact us for spot-on help in living your best life!